January 6, 2016 will go down as a historical day in Kansas City Royals history. After a lifetime of losing superstars to trade or free agency because of a price tag too rich, the Royals finally won a battle and retained star outfielder Alex Gordon. What was once a foregone conclusion that Gordon would depart for greener pastures, suddenly turned into the reality he might finish his career as a lifetime Royal and one of the best of all-time. While I’m not ready to build a statue and retire his number, like many are suggesting, I’m at the front of the line regarding the move although my sentiments are as much personal as they are about stats or legacy. People ask me all the time who my favorite Royal is and I always shy away from a direct answer because I pride myself on trying to connect and build trust and relationships with every player. It’s one of the most important aspects of my job. First baseman Eric Hosmer is a guaranteed go-to superstar for me. Pitcher Yordano Ventura is fun and an adventure with his growing English skills (“oooh baby”) and catcher Salvador Perez has spent more time on camera messing around or tossing Gatorade than anyone. Lost in the shuffle is the stoic, routine-oriented Alex Gordon, who rarely can be found at his locker (probably working out, stretching, downing protein shakes) so the media tends to respect but not seek out Gordon. My relationship with Alex is different. He’s one of only two players left on the Royals from when I moved to Kansas City in 2008, along with pitcher Luke Hochevar. Following the World Series celebration, I sent two players congratulatory text messages. Gordon and Hochevar, two close friends who I’ve watched grow up from youngsters trying to overcome major struggles at the big league level to accomplished veterans, and more importantly loving husbands and fathers. I know I can always chat with Hochevar through the good or bad about baseball or life and with Gordon I see a phenomenal sense of humor that often goes unnoticed by others. Years before Perez became the Gatorade dumper, I received more than a few drops from a Gordon postgame toss. I don’t remember the interview or who he targeted but Alex’s strength meant I could not fully avoid the line of fire. An hour and a half later, sitting on the team charter in a suit waiting to take off for St. Louis, my neck was covered in sticky Gatorade and Gordon walked by me as he boarded. With a big smile, he looked at me and said, “Did I get you?” A big handshake he initiated with me during a spring training game happened one year too quickly for me to realize his batting glove was covered in pine tar. This was no mistake. My hands were sticky the rest of the night. There was that sly grin again. And the picture included for this article was taken after I lost a bet on a football game between our alma maters Nebraska and Wisconsin. If my Badgers won he would wear a Wisconsin hat. If his Huskers won, I would have to wear his game hat during batting practice. Keep in mind it was September and he hadn’t changed hats all season. I lost and spent a miserable 20 minutes wearing the smelliest hat in the history of sports. Forget about pride. I couldn’t breathe for the rest of the night. Every description you have read or heard about Gordon is true. Ultimate teammate, hardest worker, and of course family man. His teammates call him their captain. His family calls him “Al” but when all is said and done we will all call him a Royals Hall of Famer. Here’s to hoping for four more productive years, preferably with Alex Gordon wearing a Wisconsin hat! Joel your way with words and the stories you tell make me feel like a kid again listing to my dad or grandpa tell stories of old. I remember the hat deal, that had to been the nastiest hat in the Midwest, I’m surprised your hair didn’t fallout. Joel … I love ya man, but batting is spelled with two ts. PS. 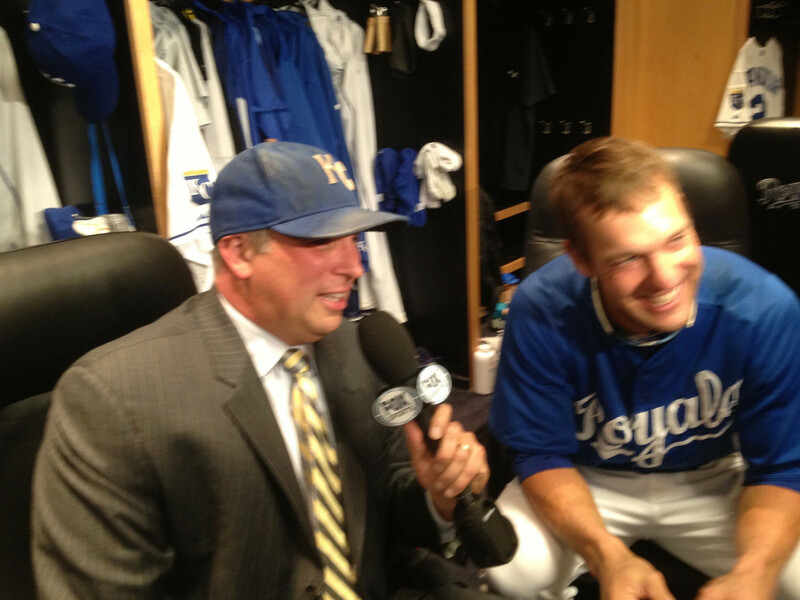 I’m happy that you’re with the Royals broadcasting team … one of the best in baseball. Dig it, Joel. Thanks for the perspective and glimpse behind the scenes.